My spouse and I are most fortunate to have a friend who generously offers us the opportunity for a weekend stay at her condo in Nags Head NC. 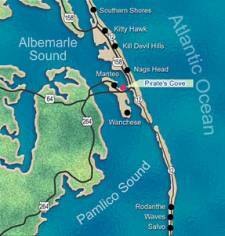 I had never been to the "Outer Banks" before. “Absolutely!”, I proclaim, when Maureen asks if I’d like to join her for the weekend. The drive from the north is a bit of an ordeal, as the Google directions show an intimidating number of different routes. Not so much because there is a need to change actual roads, but that the road strives to confuse the motorist by changing from I-64 to I-664 to I-464 to Rt 158 even though we seem to remain on the same road. After this bit of confusion, we are treated to the contemporary American experience of gridlock. We lose 40 minutes stuck in traffic, but we don’t mind. Nothing on our Friday evening agenda besides a quick dinner and bed. Crossing the Wright Memorial Bridge on Rt 158 is alarming, as there are countless signs urgently requesting that trucks and vehicles carrying gas containers be inspected before crossing. We cross anyway, despite what is now an immense fear that we will die in a horrible explosion from a nearby tanker truck. The condo is reasonably easy to find. It is located in the uniquely named “Kill Devil Hills.” We speculate about what sort of bizarre history would have led to a town being saddled with such an odd name. Weather our first morning is glorious. Our puppies have a big time on the beach. Unleashed, they engage in their usual naughty, mischief-filled investigations. On a beach, this largely means seeking out a dead fish, which for our dogs means one important thing: “Puppy Perfume,” which they are delighted to apply to their fur by rolling it on. The beach sand is quite nice. As we stroll, we are delighted to spot several clusters of happy, frisky dolphins engaged in their morning feeding as they leap to grab breakfast below. Quite a few beach fishermen are also seen, which tells us that these are productive fishing grounds. For humans as well as dolphins. Later, we take our kayaks out for some paddling in the sound. 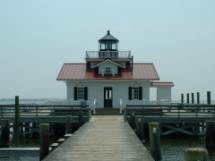 After paddling, we are delighted to discover a wonderful, charming, historic town of Manteo. 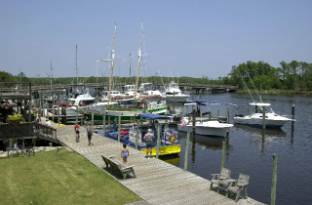 Here, one finds walkable streets, shops, and a long boardwalk full of impressive boats. We enjoy a few microbeers (mine a flavorful oatmeal porter), and head back to the condo. On our route is a hang-gliding school. I try to sign up but am unable to, because they are sold out for the weekend. I intend to sign up at a future date, however. Who could resist hang-gliding in the Kitty Hawk location? A location “first in flight”. Hang-gliding in the same place where the Wright Brothers first showed, with their flying machine, that humans could experience the sheer thrill of flying like birds. Along the way, I am disappointed to notice the awful strip commercial ambience that has sprung up, cancer-like, along Rt 12 on the Outer Banks. The Anywhere USA plague that afflicts so much of the United States. The next morning, our stroll on the beach is a bit saddening. We spot three beached juvenile nurse sharks and countless "blowfish" lying dead or dying in the sand. Not sure what happened, as I am not a marine biologist. My speculation is that an evening thunderstorm had tossed them to extreme reaches of the beach due to a strong wave surge. I certainly intend to return. Not just to fly, but to scuba dive. 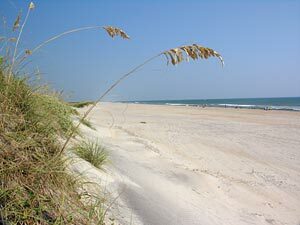 The Outer Banks, I was astonished to learn while there, is home to a staggering number of shipwrecks. Surely a divers paradise.